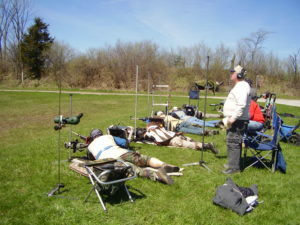 The Fort Wayne Rifle & Revolver Club conducts a full schedule of NRA sanctioned high power matches, along with a mix of other rifle matches, including CMP sanctioned John Garand Match and CMP Games Matches. Matches are shot at 200 and 300 yards on our 12 point High Power range. Our lightweight target carriers make pit duty a breeze. All matches are open to the public, club membership is not required to participate. Winter offhand matches take place in November through March, and are generally scheduled for the 2nd Sunday of the month. Registration and setup start at about 12:30 with first shot at 1 PM. Check the overall range calendar for specific dates. Thursday Afternoons; 3:00 P. M. until dusk. Start about May 3, depending on weather. Final Practice October 10.